Bolder Energy provides energy efficiency and energy management consulting and turn-key services for buildings. We are devoted to helping small and large businesses, governments, and communities obtain a competitive advantage in a future of energy awareness. Our client-specific strategies identify cost-effective energy-saving solutions, direct proper implementation, and ensure persistence of energy savings and your returns on investment. Bolder Energy provides a high level of personalized client attention along with senior engineering expertise at a cost-effective rate. Services and solutions are adjusted to meet a client’s specific needs, ensuring a project that meets your energy objectives and budget. Bolder Energy also has a growing network of strategic partners to offer expertise in additional areas and provide resource-depth when needed. Learn more. Bolder Energy is a Qualified Service Provider for the City of Boulder's Building Performance Ordinance (BPO) and for Xcel Energy's Retro-Commissioning program. Contact ​Bolder Energy for assistance in complying with the BPO and/or in conducting the required Energy Assessments and Retro-Commissioning study for your building. Bolder Energy's experience with peak electric demand management has enabled a Denver, CO manufacturing facility to save over $14,000 per year in just electric peak demand costs. This was accomplished through simple improvements to equipment startup procedures and equipment temperature control set points. The payback period, including installation of a eGauge submeter for on-going monitoring of the facility's electric energy profile will be well under one year! 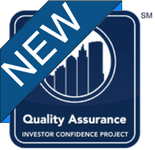 Bolder Energy was approved into the first class of the Investor Confidence Project's Credentialed Quality Assurance Providers. Bolder Energy is now authorized to conduct third-party review for projects originated by Credentialed Project Developers and certify those projects as Investor Ready Energy Efficiency™ (IREE). The IREE certification assures building owners and investors of all types that the underlying engineering fundamentals of a project are sound and that predicted returns have been calculated correctly.